We’ve all seen the movie Bride Wars, and if you haven’t then you really should, it’s heartwarming and hilarious. But nobody can deny that some women, not all, but some, feel a massive sense of competition when it comes to the big day. Having myself lived in a house containing 3 newly engaged women (we were all in our final year of university) and worked in the wedding industry for years I can tell you that every bride is different. Every process of planning a wedding is completely individual. It depends on the person, everyone has different ideas, and varying tastes and differing budgets. I witnessed everything from the phrase “I’m not worried, it’ll be grand” to “I got engaged 3 days ago and I’m actually the most stressed I’ve ever been in my life, this is hopeless.” I have also seen brides declare that they want to arrive on an elephant and brides state that they literally don’t care as long as everyone they love is there. So we’re all different. What’s important is that you’re making the commitment to spend your life with the person you love most in the world and your focus should be on that rather than whether your do was better than Sue’s from next door. I’ve had someone try to get the better function room in a hotel that I worked in previously, by calling us to tell us the bride who had previously booked the larger room had called off her wedding. Having met with said bride and groom that morning, we knew this to be untrue. 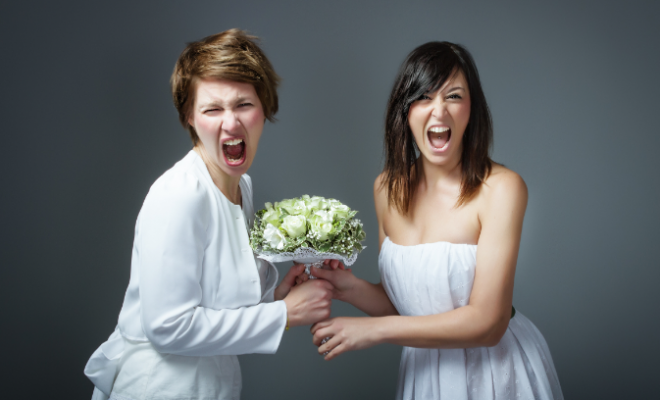 Weddings tend to make people crazy, and sometimes a girls inner bridezilla can come out to play. This will not only ruin your day, but ruin the day for your guests, your family and your groom. When you’re spending so much time and money on an event, it’s natural to want it to go well, but remember, the marriage is more important. So keep your perspective, keep your cool and keep your head. You’re wedding will be just as amazing as you are and it may be different to the ones you’ve attended before, but as long as you’re happy that’s what will matter. Do let’s take the competition out of it ladies, it’s not about who has a nicer dress, or whose cake was bigger, it’s about love. So when they urge takes you, put down the bottle of blue hair dye and remember to clap for eachother. If they want something different, accept that. Recommend anything you know to be good.